We were in Boston over the weekend and I got back last night in time to take a good look around the changes in the garden wrought by a few more days of sunshine. 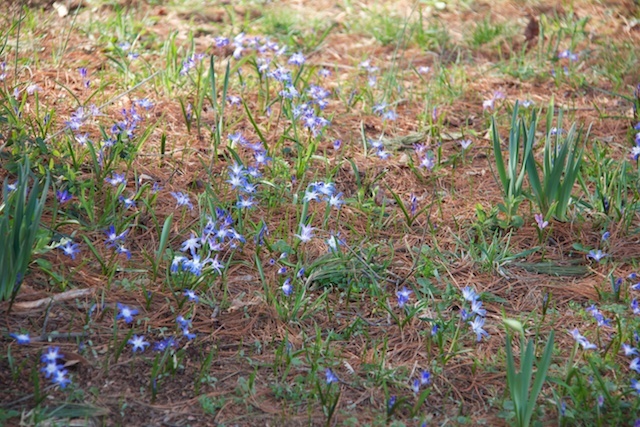 The thing that most caught my attention (and sent me into the house for the camera) was this Chilean Blue Crocus. This was a new one for me. I had grown the Leichtlinii variant last year and was very much taken with the white face surrounded by sky blue edges, but I hadn’t ever seen the standard Chilean Blue before. 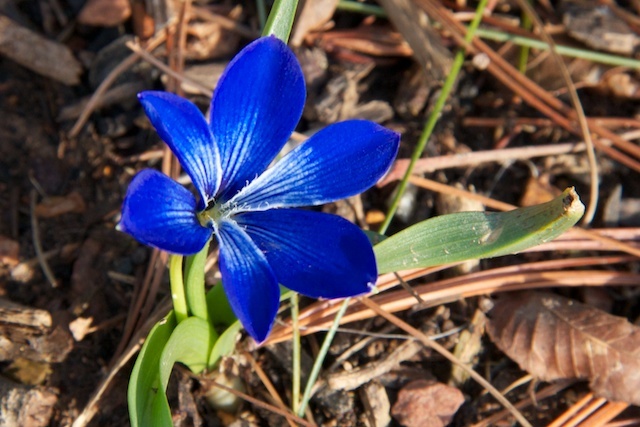 The blue is a very dark inky blue (I refuse to call it gentian blue so as not to arbitrarily favor the gentiana over the crocus genus) and it’s definitely an attention-grabber. 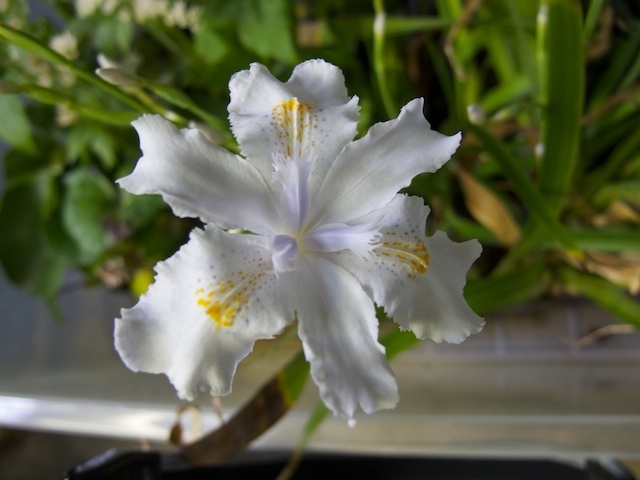 This one came from Telos Rare Bulbs and they also had a violet-flavored version. With a little luck maybe that will flower this year as well. 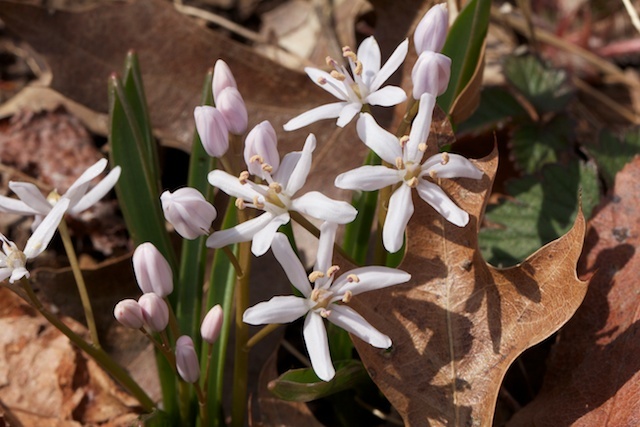 Besides numerous Daffodils, Bloodroot, Daphne, and Pieris there were other flowers of the bluish persuasion coming into flower when I returned. Note the startlingly blue anthers on this reliable Scilla. 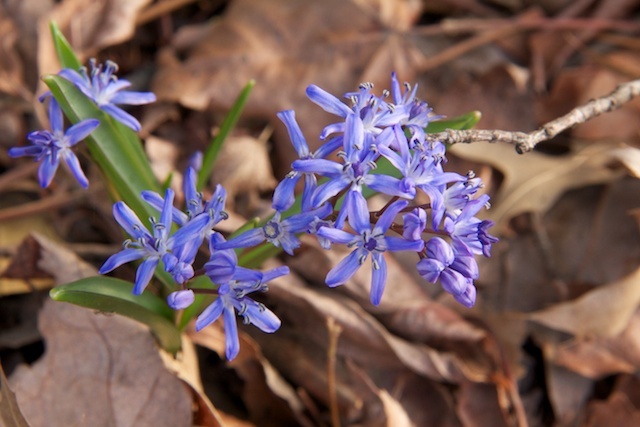 The Scilla bifolia is small but packs a lovely early punch. And the remarkable Glory of the Snow is exerting its wild power over the landscape. We probably have several thousand at this point. 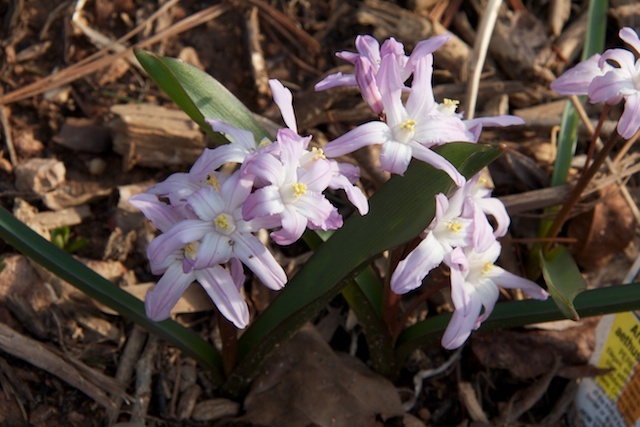 They are just lovely as clumps within the perennial garden in both the blue or pink forms. 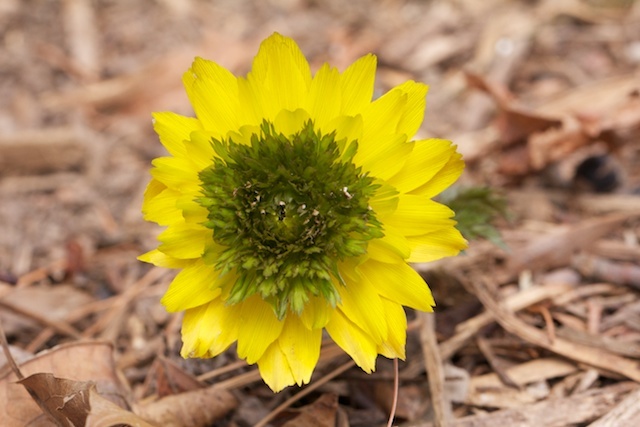 But they are also lovely just naturalized in the lawn or forest grass. 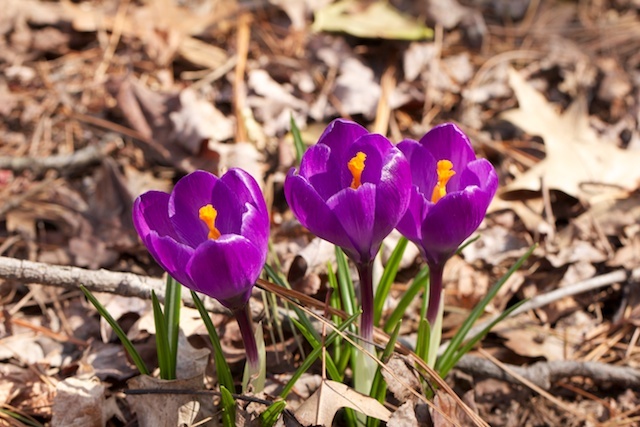 Beside them the larger flowered Violet Spring Crocus makes a definite statement in a group. 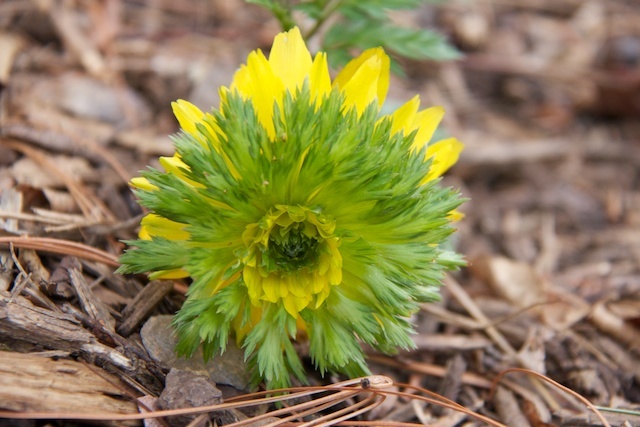 The ever wonderful Adonis amurensis ‘Sandansaki’ had opened further in my absence. It has acquired a Lion’s Mane that makes the flower head so heavy that it can no longer support itself without leaning on the ground. Looking from the far side gives yet another view of the ‘Sandansaki’ varient. 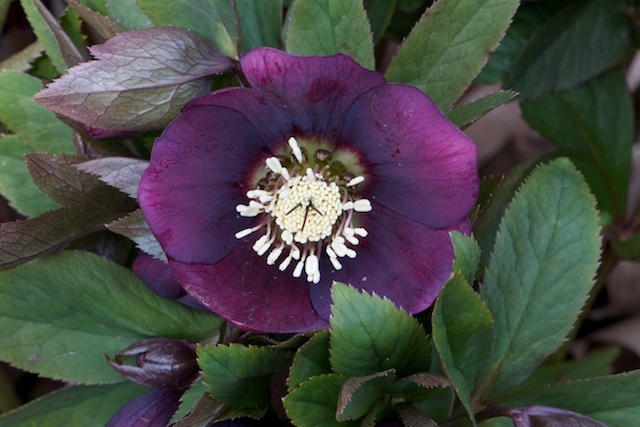 The Hellebores are all coming out to play. One of my favorites is the Green Corsican. This was one of the plants I picked up at last years Plant Delights Open House. 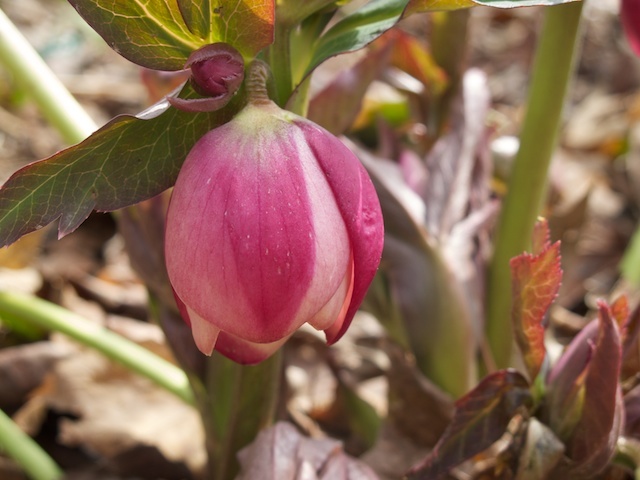 The foliage is an added plus and it has real staying power throughout the Hellebore blooming season. It seems fitting to lead off my GBD post with the surprise that I found this morning when I went out to inspect the gardens. 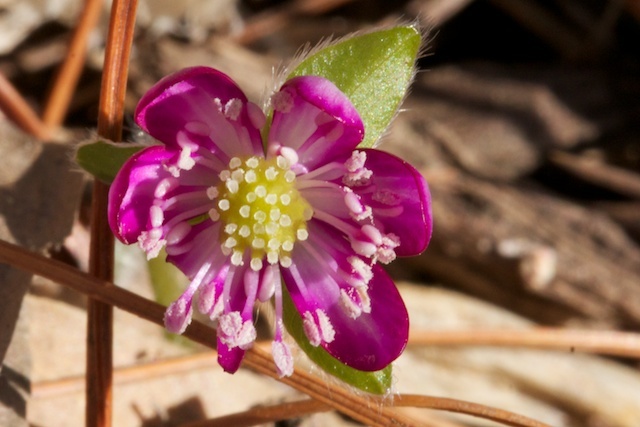 This cheerful little Hepatica is a tiny little bright spot in the Camellia bed. If I remember correctly I accidentally knocked the bud off of this plant last year as I was pulling leaves away. That makes it a double pleasure this year. There are a good many other plants in flower right now. None of them catch my eye more reliably than the two Adonis. 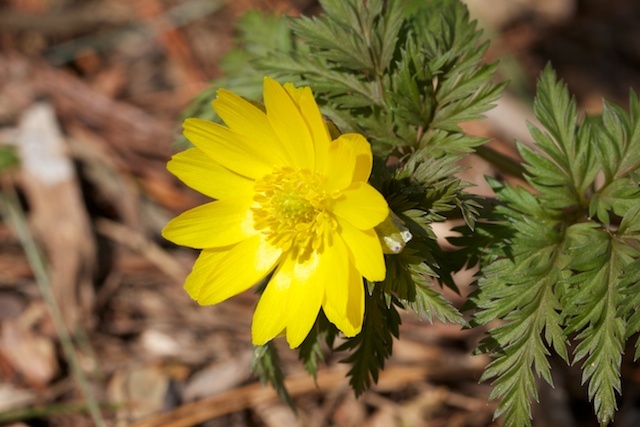 The early blooming, long-lasting flowers, and feathery foliage make these plants real winners. 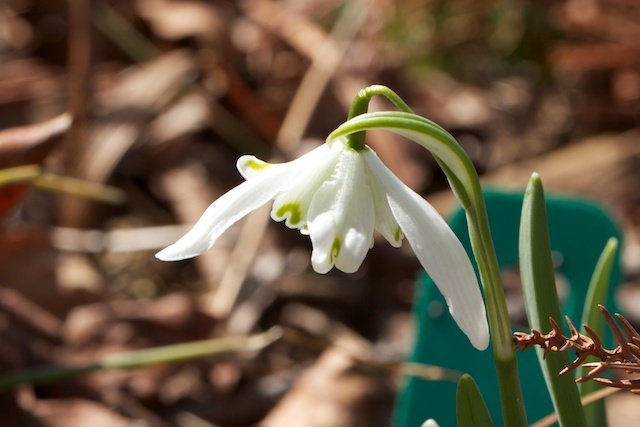 There are a lot of snowdrops still in bloom around the yard but I looked a little closer at one batch and realized that they are the double flowered Floro Plenos. While I’m far from being a Galanthophile I am at least beginning to be able to tell some of the varieties apart. The double form does look more fuller and broader than the single. 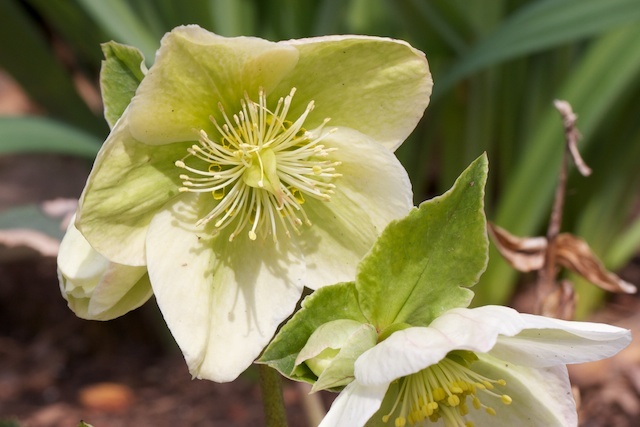 We have many Hellebores opening up right now. Enough to make me wish I had done a better job of labeling them. Even when they haven’t bloomed the buds look like upside-down tulips and they are quite pretty in this mode as well. 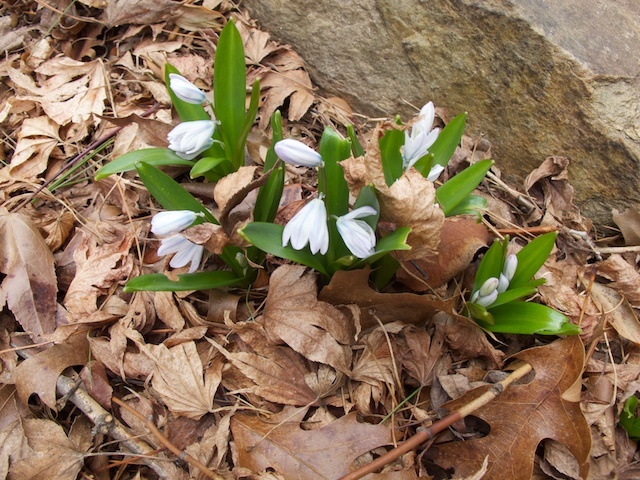 And everywhere around the hill the Glory-of-the-Snow are putting up their buds. The Giant Pink ones have a slight lead but the regular old blue ones are not far behind. 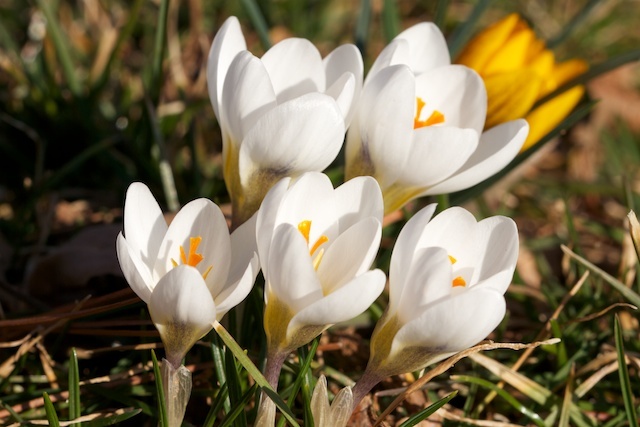 Meanwhile I won’t spend too much time on the Crocus which are abundant at this point. 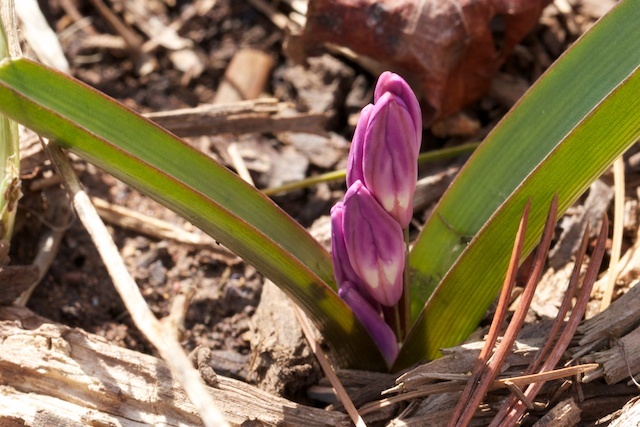 Not only the many species types in the lawn but the giant crocus are now doing their thing. 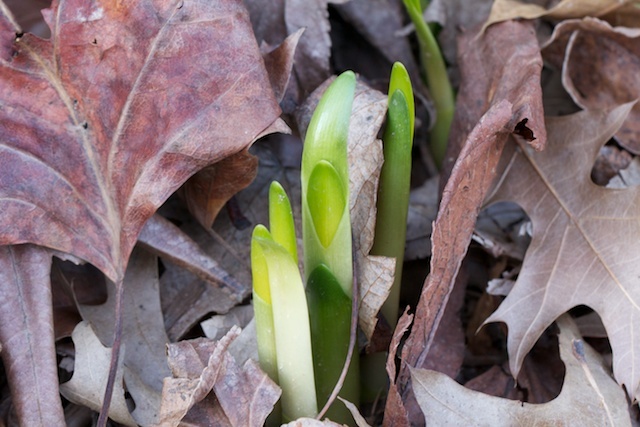 Going down into the woods I found the first batch of Daffodils — the Little Gem are among the earliest Narcissus that we have. 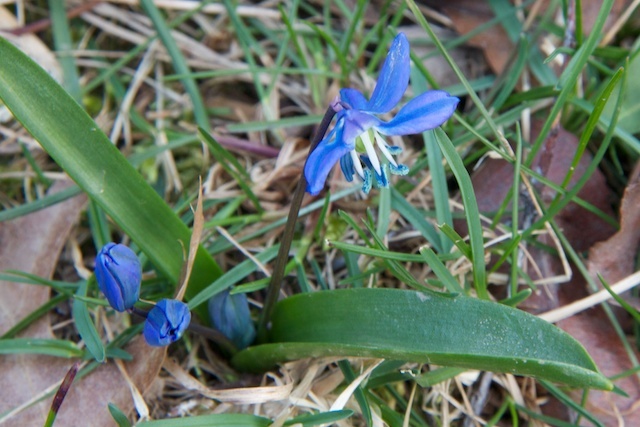 The thing that I had forgotten was how early the Scillas appear. In a couple of places we have the Puschkinia actually multiplying. Note the beautiful blue lines on the backs of the flowers. 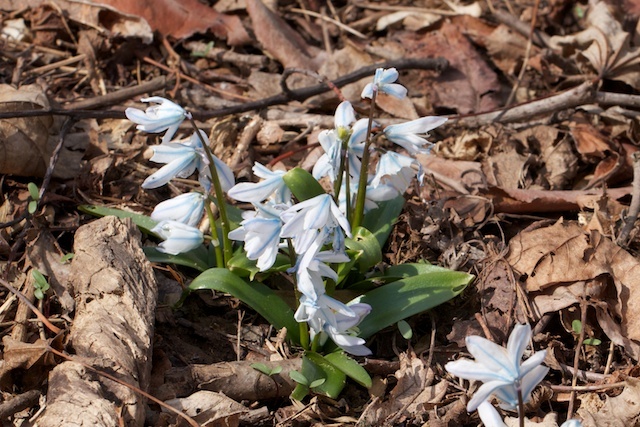 One flower that I really like a lot is the diminutive Scilla bifolia ‘rosea’. 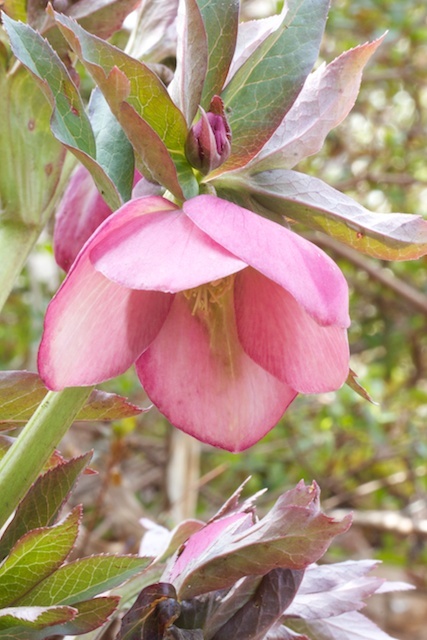 The pink part that contributes to the ‘Rosea’ is more obvious in the buds and the stamens. This was originally just a single flower bulb and it’s obviously spreading. The flowers are tiny but they turn upwards and look right at you. Highly recommended. There are a few more plants on the way that are worth mentioning as well. 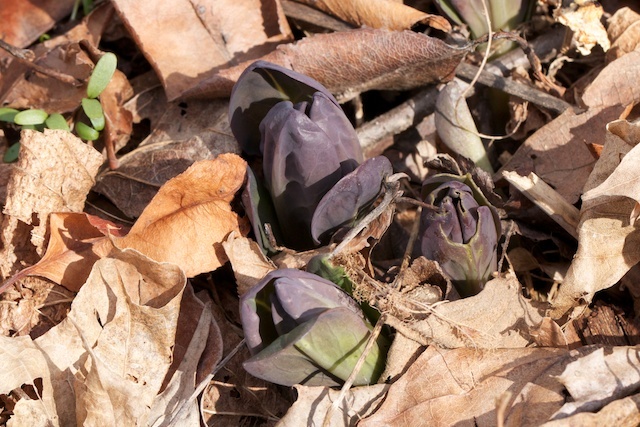 The Virginia Bluebells are coming out already. 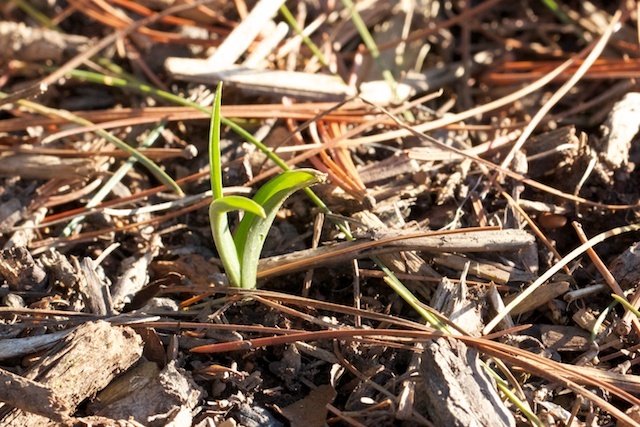 And the emerging Camassia have a wonderful foliage for this time of year. I’m not usually a fan of yellow margins but on this bulb it looks very striking. And lastly, I was more than pleased to see that Molly the Witch is off to a really good start — will there be flowers this year? If you want to see how other gardens are proceeding at this time of year the Bloom Day is hosted by May Dream’s Gardens. I drove in late last night from my trip to North Carolina (for plants at Plant Delights Nursery) and for baseball inspiration in Florida. Both parts were very successful. 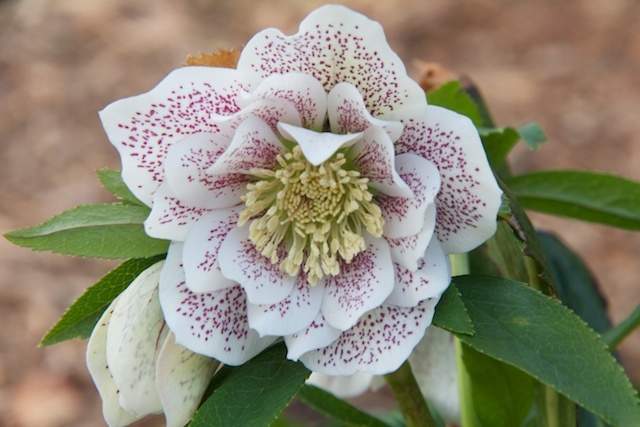 I brought back three tubs of plants including the lovely Wuhan Angel shown above. I had great time at the Plant Delights Open House and spent four hours going through the stock they had put out for sale. I brought back more than enough to keep me busy once spring planting is possible. 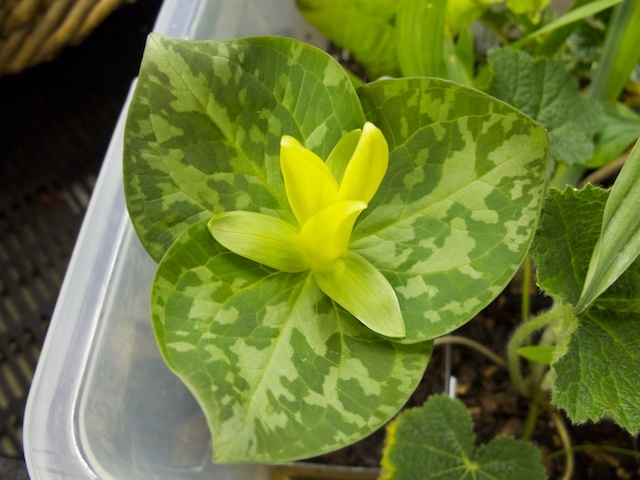 The new plants included several Trilliums including this Yellow Trillium. 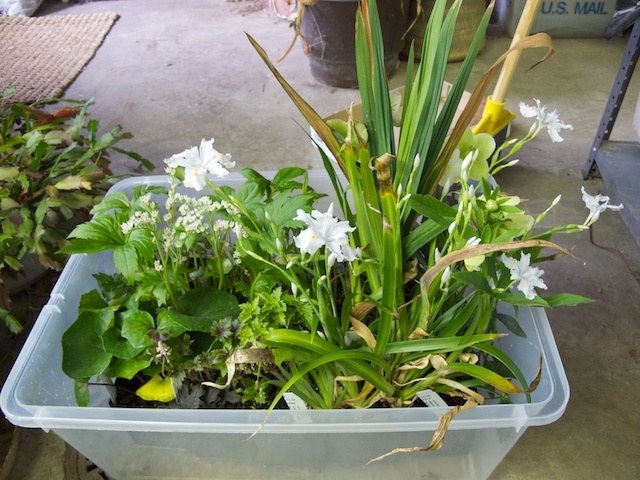 Outside we had had torrential rains and flooding so things had not gotten too far past where I left them a week ago. 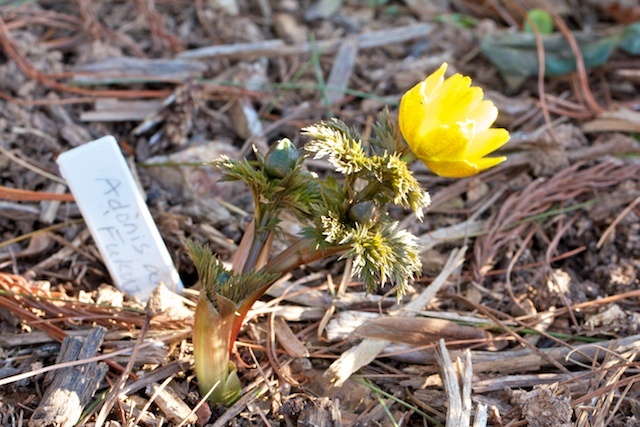 I did find that the beautiful Adonis had clearly added additional buds. 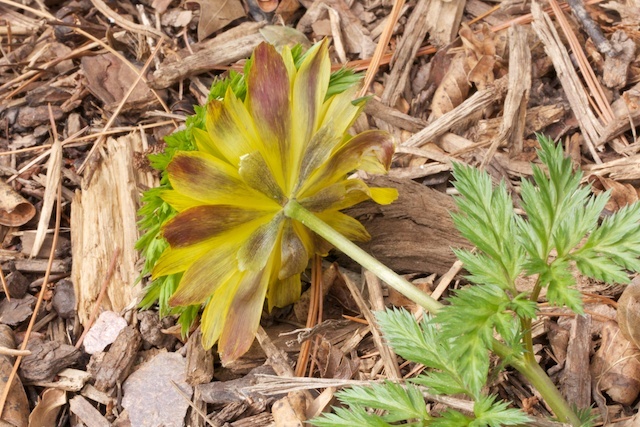 and noting that there is an Adonis-like sprout showing up about 6 inches away from this flower. So maybe a runner, or did I plant another one as well. We shall have to be more patient than is our wont…. 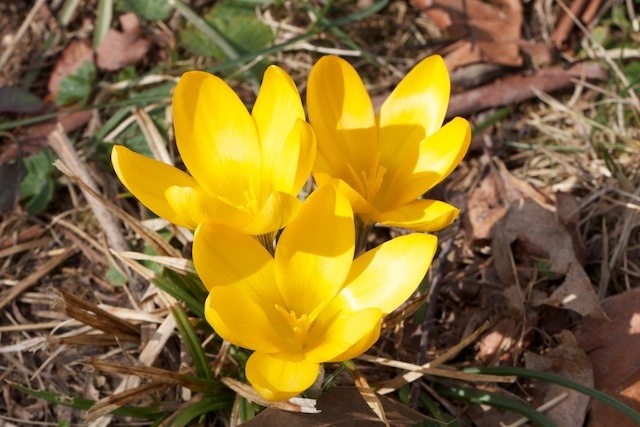 Many more Crocus were showing all over the lawn and the first two Daffodils have flowered on the hillside. 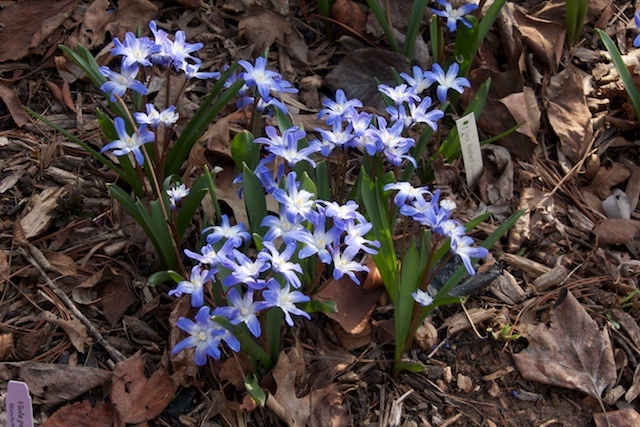 More surprising was to see an old Scilla planting (no idea of the variety) already in bloom in a very shady spot to the front of the house. 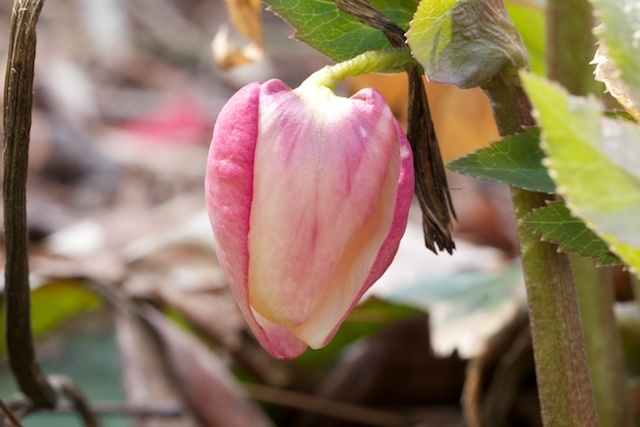 And the Helleborus are starting to open in many spots around the yard. As I made my last walkabout before heading down to spring training for a week (Go Orioles! ), I couldn’t help noticing how some of the plants just continue to multiply through good years and bad. 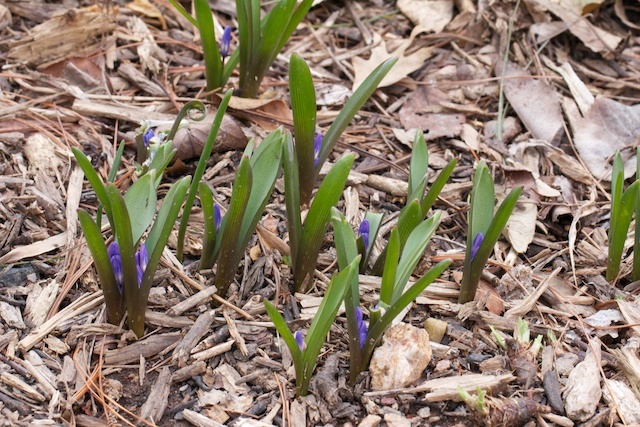 The little species crocus don’t always get started (squirrels probably) but when they do I see them making little clumps of flowers where I originally planted just one. 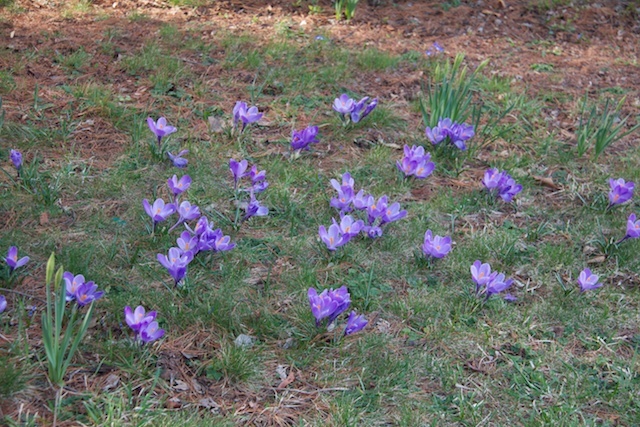 My original planting method was to mix them all up like bags of jellybeans but now I prefer a swath of one kind of crocus. So in a way nature is beginning to make its own mini-swaths in the grass. 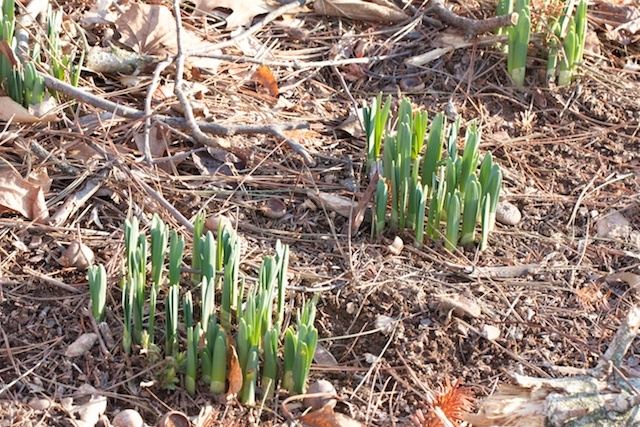 I can also go back and look at the original daffodils that we planted on a treeless hillside 35 years ago. 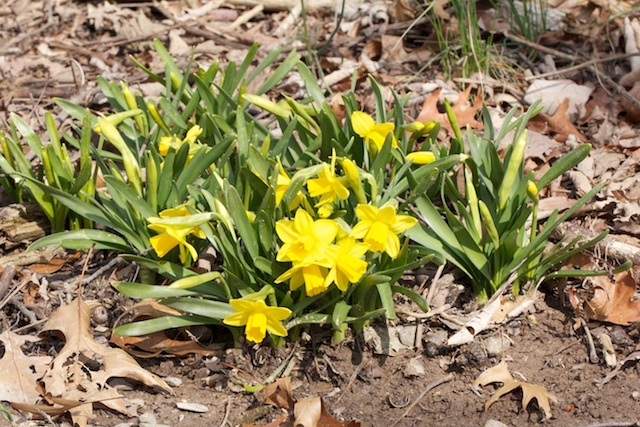 While there is not a one to one correspondence between years and numbers of daffodils you have to note that these daffodils now sit under a towering oak and multiple smaller flowering trees. No one has ever imagined dividing these bulbs since they still put out a respectable number of flowers. I’m sure a more attentive gardener would have dug and replanted these frequently but there are areas of the garden where I just like to let nature take its course. 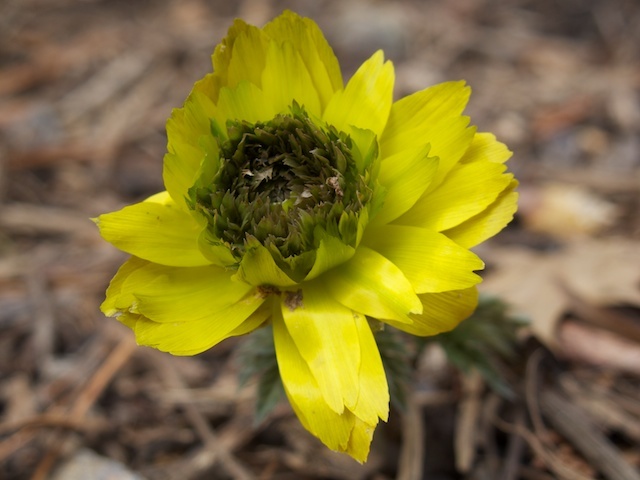 Speaking of multiplying I was very pleased to see that the Adonis I mentioned previously has multiple buds (at least 3 more) following the first pretty flower. This implies to me that it not only survived its first winter but it’s actually happy! The only source that I know of for Adonis now that Asiatica has closed its doors is Fraser’s Thimble Farms. 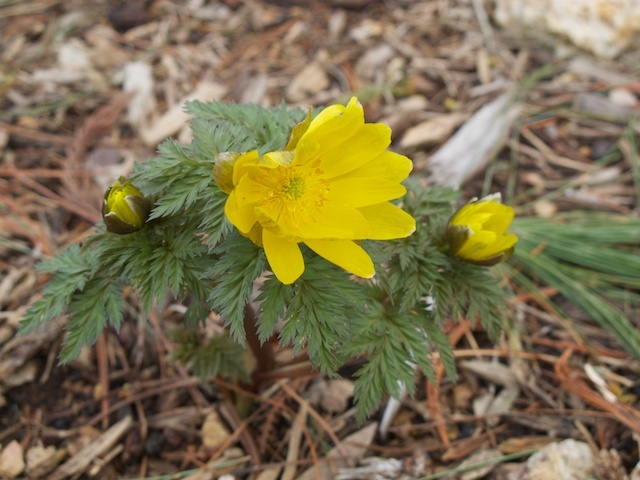 They are located in Canada but they will ship to the U.S.
And alongside the Adonis I see what may be (if the label is to be believed) the first emergence of the Chilean Blue Crocus. I was so enamored with this flower last year that I planted two more (they are not cheap). Of course since I planted two more I won’t know whether I had any successful wintering over until I can count 3 of them. One of the other games at this time of year is trying to recall what it is I planted and where. 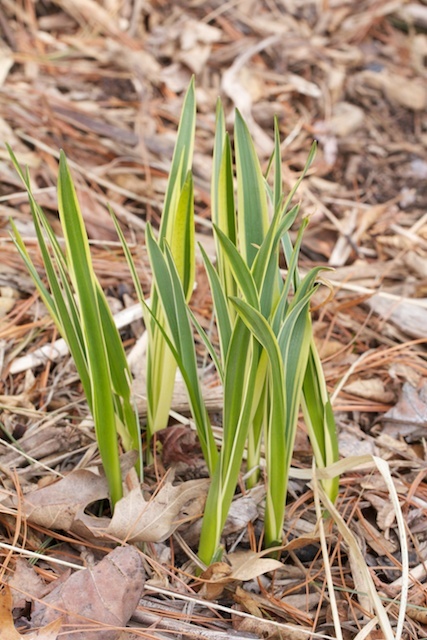 Some of the bulbs look remarkably similar when they are just starting out. For instance, I wonder what this one is. All such questions will be answered very soon. In the meantime I’m now in North Carolina, on my way to Florida. 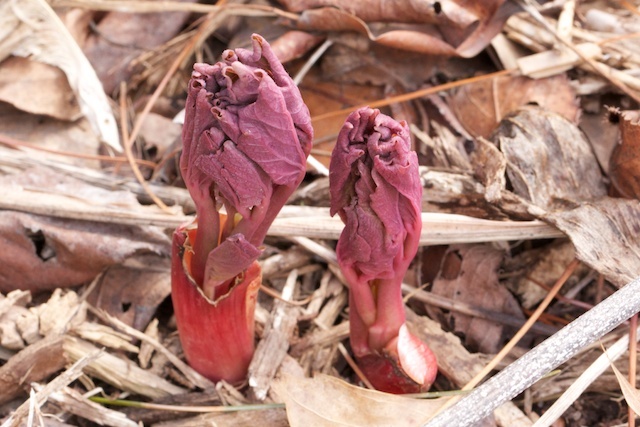 The Maples were getting red buds and the daffodils were blooming as I drove through Virginia. And down here in Garner I see Cherries in bloom. Tomorrow I intend to visit the Plant Delights Nursery Open House and see what treasures I can take away.